Win Two Tickets to The Big Cheesy! You don’t even know what it is I bet, but I also bet you want to go. Because who wouldn’t want to go to an event called THE BIG CHEESY?! It’s big. It’s cheesy. That’s all you need to know. For all of you nitpickers who need more information, The Big Cheesy is a grilled cheese competition (cue excitement) on March 23rd and 24th. Brought to you by Openhouse Gallery, The Big Cheesy will feature some of NYC’s best sandwich slingers, including returning champion Melt Shop, as well as Milk Truck, Murray’s Cheese, Lucy’s Whey, Sons of Essex, and Tom Colicchio’s ‘wichcraft. And what goes great with cheese? Anything. Beer. Sixpoint tallboys will be on hand to provide some brew to wash down the gooey, cheesy, crunchy, messy…oh my god I’m turning myself on…you get the idea. Tickets to the Big Cheesy are $25 each for a one-hour time slot (between 12 pm – 7 pm); patrons get one hour to sample each sandwich, then vote for their favorite. Sounds like BIG CHEESY FUN to me! Get your tickets here. – The winner will be chosen at random, then announced on Tuesday, 5/19 before 5 PM EST, so hurry and enter for your chance to win! NOM. 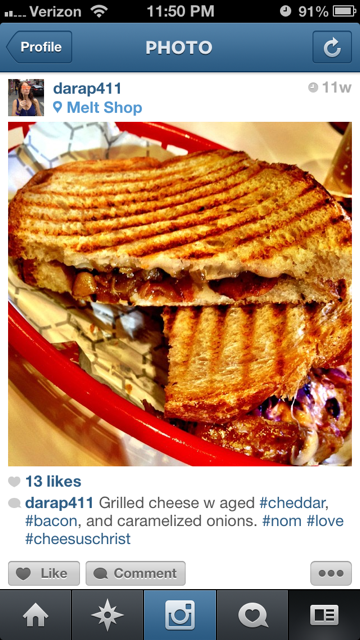 See below for my “almost” dream grilled cheese from Melt Shop. I Instagrammed it. texas toast … with cheddar, gryuere, and goat … PLUS bacon and a fried egg ! sharp cheddar, flame grilled tomato crispy bacon a touch of dijon mustard, and must be cooked in the bacon fat leftover from cooking the bacon. goat cheese, bacon, rosemary, arugula. Cheddar, mozzarella, grilled tomato and bacon topped off with mayo on sourdough bread. Sourdough, thick cut bacon, sharp cheddar, tomato, avocado (added post grilling), whole grain mustard, napkin. see I was thinking more like a big paper napkin. Less flair but more absorbent? Sharp cheddar, extra crispy bacon, arugula, and tomatoes (on the side – no sogginess is happening in my ‘wich) on sourdough…sometimes on some good Jewish rye. asiago, muenster, parmesan and butternut squash.